About the Book: Aelwyn Myrddn is returning the palace after four years away in Avalon. She is the daughter of the Head Merlin and will serve the kingdom and her childhood friend Princess Marie and the Franco-British Empire with her magic. In order to secure peace with Prussia, Marie is to marry Prince Leopold, but she has no desire to rule. Leopold was previously engaged to Isabelle, but that engagement is dissolving and Isabelle is determined to keep Leopold for herself-she needs an escape from her awful cousin and guardian. Leopold's brother, Wolf, is reckless and rebellious and an embarrassment to the kingdom. Ronan Astor is traveling to London for the season to catch a rich titled bachelor to save her family's wealth. Aelwyn and Marie find themselves caught between duty to the kingdom and dreams of a different life. So when they devise a plan that could grant their wishes for the future, will they follow their heads or hearts? 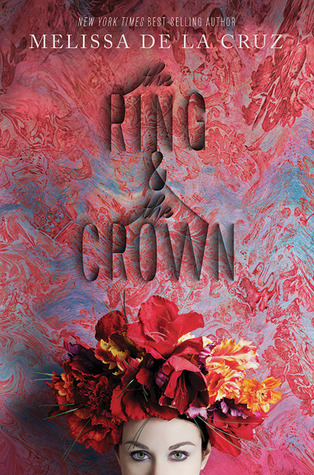 GreenBeanTeenQueen Says: The Ring and the Crown reminded me of The Luxe Series with magic. The story is set in an alternate turn of the century where magic can equal power. The main story revolves around Marie and her impending peace keeping engagement to Leopold, but there are many characters in play making this a wide cast of characters all looking for their own perfect path. At first the many plot lines and characters don't seem to connect, but as the story continues, everyone's path crosses and the stories begin to intertwine. I would describe this book as fantasy light. While there's a magical system in play, we never get much backstory of how it works. We're offered some glimpses, but there are few rules set forth. It's set in an alternate history which means the author can get away with a lot because it's not true history, I didn't have a problem with the alternate history timeline and enjoyed it, despite the fact that little is explained of the kingdoms. The world doesn't come with many details. There's not a lot of in depth world-building and the characters are interesting enough but I'm not sure they have much depth to them. Despite the light character development and world-building, I really enjoyed The Ring and the Crown. It's a fun, escapist pleasure that filled my desire for a quick read. I especially liked that the story didn't follow the typical path you would expect and while somewhat predictable, I liked that it wasn't too much of a formulaic romance. The happy ending isn't the typical romance happy ending but I still felt very satisfied with the way things turned out and it felt true to the characters. There were some major plot points that were brushed over very quickly in the end in what felt like an "oh by the way, here's a quick explanation about that" way. I would have liked more details, but it was still fun. I would give this one to your readers looking for a gossipy read with a Downton Abbey feel. If they want magic, romance, duty, honor, royalty, titles, money and power all wrapped up in a juicy historical bow, this title would be perfect. Full Disclosure: Reviewed from e-galley received from publisher.